When we saw that someone was selling Google Glass, the new, experimental Internet-connected headset, on eBay, we had our suspicions. Now the listing is gone. The bidding went as high as $15,000—10 times the official price at which Google is selling Google Glass to developers and a handful of lucky souls who win its “Creative Explorer” contest, which ends today. But the lister didn’t actually have a headset. Instead, eBay user bla7kcat promised to obtain one and ship it by March 5. Which sounded impossible, since Google said it wouldn’t even pick winners in the contest until mid-to-late March. We asked eBay about the listing. “This is in violation of our presale policy so we will remove [it],” a spokesperson told us Wednesday morning. And sure enough, it’s off the site, redirecting to a search page. 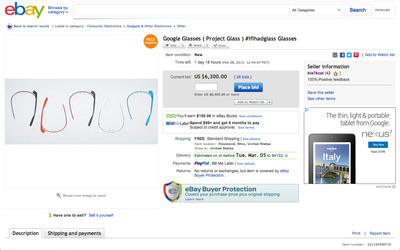 There are no other Google Glass listings and bla7kcat, who has high feedback ratings on eBay, has no other current listings. We contacted bla7kcat for his or her side of the story.